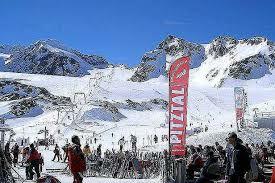 I am enjoying my skiing SO much here in Pitztal. I think I over-cooked it last year (I did far too much) but, after a break since the summer, I am absolutely loving it! It helps, of course, that I am skiing well! During the summer I have spent quite a bit of time with my personal trainer, rather than on the hill, as usual. I can definitely feel it paying off. I also think it has helped with energy versus tiredness that I didn't spend the summer in the southern hemisphere. I think travelling to New Zealand is more draining on the body than just the skiing alone; the travelling and the enormous time difference definitely sap you of energy and vitalility. This is not a problem you get when you train on European glaciers! It is the first time, since February, that I have seen (or even heard of) a fellow Irish skier in action in the mountains (other than my sister of course) -yesterday and today I bumped in to Cormack Comerford who is also training on the glacier here and enjoying the excellent conditions.